“What’ve they got in there…King Kong?” (Malcolm, Dr. Ian 1993). That is precisely who you will encounter on your expedition into the jungles of Skull Island at Universal Studios Islands of Adventure this summer! Fortunately, I was able to take part in a soft opening on Saturday afternoon and am able to share my thoughts with you. The presence of King Kong at Universal Orlando Resort represents a long awaited triumphant return ever since Revenge of the Mummy took the place of Kongfrontation at Universal Studios Florida (original park). 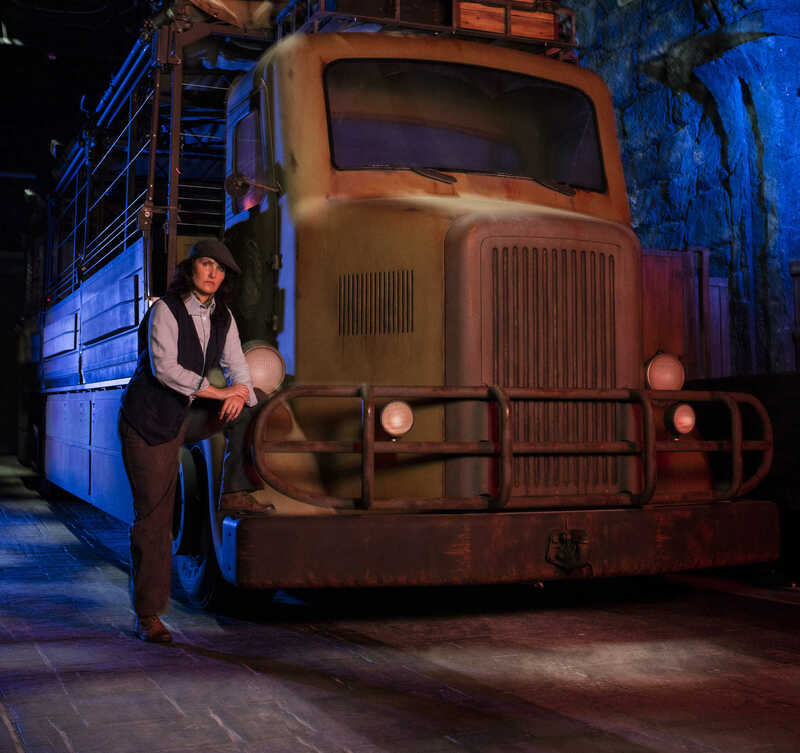 Although the ride design is completely different than the previous attraction, it is exquisitely designed and integrates trending themed entertainment attraction technology with practical effects and animatronics. 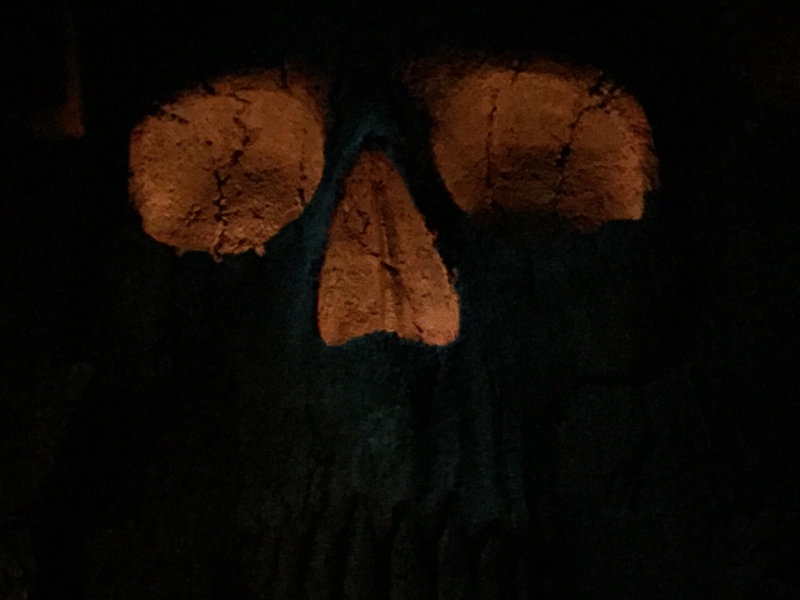 From the queue to the ride path itself, you will be completely immersed into the dark and frightening world of Skull Island. 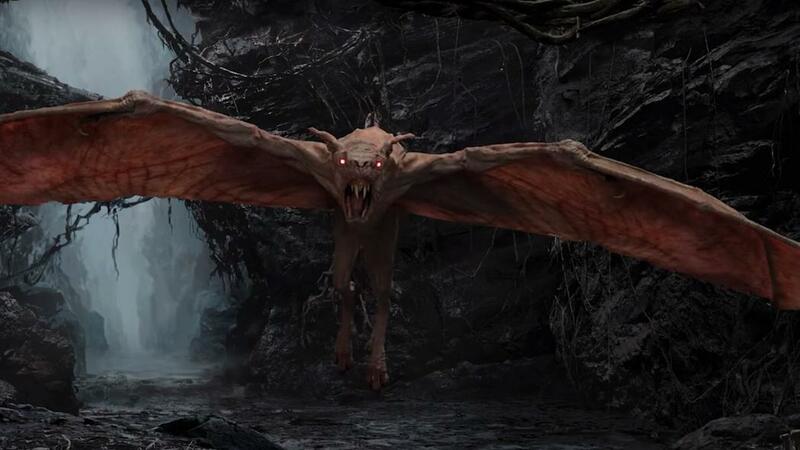 Along your expedition, you may encounter prehistoric-sized creatures, the dead, and maybe even the undead. Please visit Thrillz.co for the ultimate theme park review website! For those who have been hanging in and around Islands of Adventure for the last week, you may have had the opportunity to partake in a soft opening of the highly anticipated attraction. If not, definitely plan a trip to the park soon in order to experience the newest attraction (although, the Hulk coaster is reopening soon). What I appreciate most about Skull Island: Reign of Kong is the attention to detail, experiential storytelling, and production design. As an entertainment scholar, I was incredibly impressed with the ability to see horror film theories and frameworks woven throughout the experience. Now, is that something that the typical park guest is going to notice? Probably not. However, the fact that feel that I am going through the diegesis of a horror film serves as empirically-based observational evidence that the ride meets the expectations of both spectacle and narrative. As I mentioned on Twitter, the writings of Freud, Carol Clover, Geoff King, and Linda Williams are alive and well! The experience of the attraction begins even before you enter the queue. 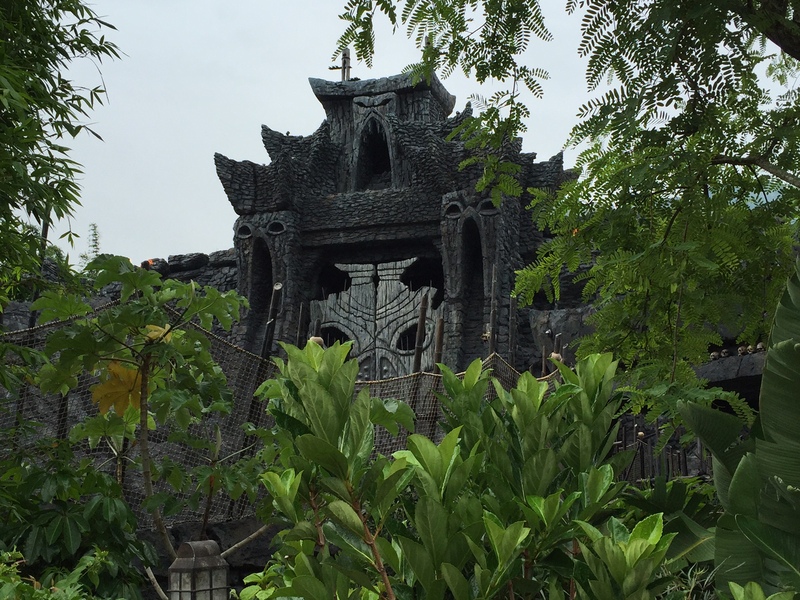 As you gaze upon the exterior design of the attraction, you will begin to feel drawn into the world of Skull Island. What lies beyond the massive 100% to scale gate? Once the thoughts of feeling compelled to venture into the jungles behind the gate enter you mind, you will have no choice but to sign up for the next expedition. If you have been to a Disney, Universal, SeaWorld, or Busch Gardens theme park, you are already familiar with the theme and story of the attraction beginning at the queue. The Reign of Kong queue is full of creative design to capture your attention and compel you to further descend into the dark catacombs. Prior to entering the indoor part of the queue, the outside is lightly themed with bamboo, greenery, and some rock formations. Thankfully, you have a great view of Kong’s massive stone gates. 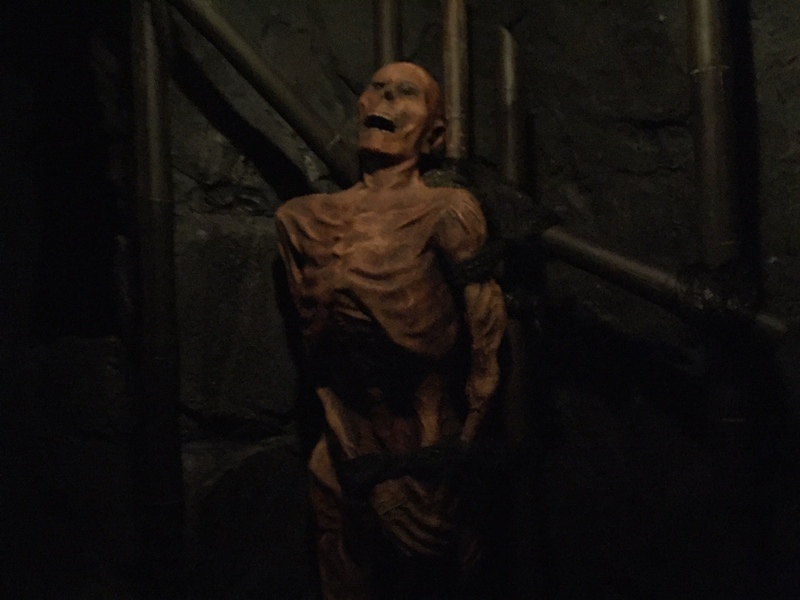 The heaviest of the queue theming begins once you enter the catacombs. It’s not called Skull Island for nothing. Between the entrance to the catacombs and the loading platform, there are hundreds if not thousands of skulls within the rock walls and openings. This is where I can really infer the adherence to horror film theories explored and defined by the scholars I referenced earlier. Just like going to see a horror film with the foreknowledge that voluntarily subjecting oneself to terror is part of the experience, the same can be said about this attraction. In Freud’s writings on the principle of unheimlich or what we refer to as the uncanny, he explains that we are psychologically drawn to that which should otherwise remain hidden. 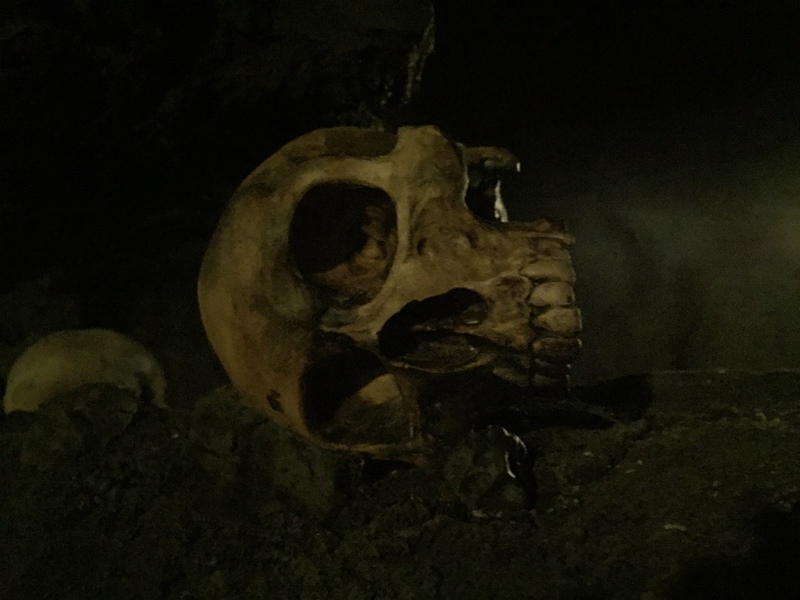 Certainly skulls of the dead are items that should remain hidden beneath the earth; however, they possess an attraction that begs for one’s attention. Moreover, scholar Carol Clover writes prolifically on the concept of the unpleasurable pleasure. What does she mean by that? This concept is a framework through which to view why we are drawn to that which would otherwise terrify us. 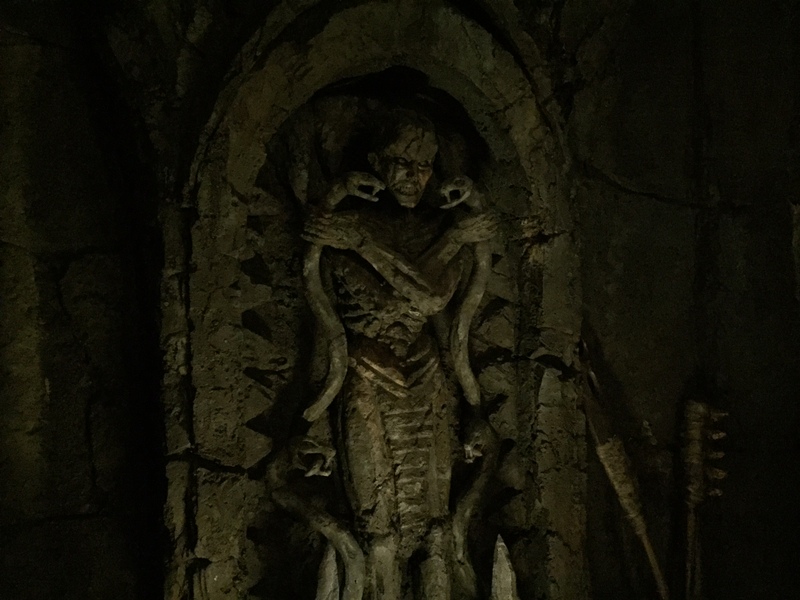 In real life, if you were to see a foreboding cavern filled with low-key lighting and the remains of the dead, you would most likely run away. But since we know that this is a ride at a theme park, we are totally okay with venting further and further into the dark now knowing what awaits. Because we are aware that we are in a safe zone, it’s okay to experience otherwise unpleasurable sights and sounds. Just like going to see a horror movie. Both Linda Williams and Geoff King write on similar topics and theoretical frameworks that deal with spectacle, pleasure, and attraction. 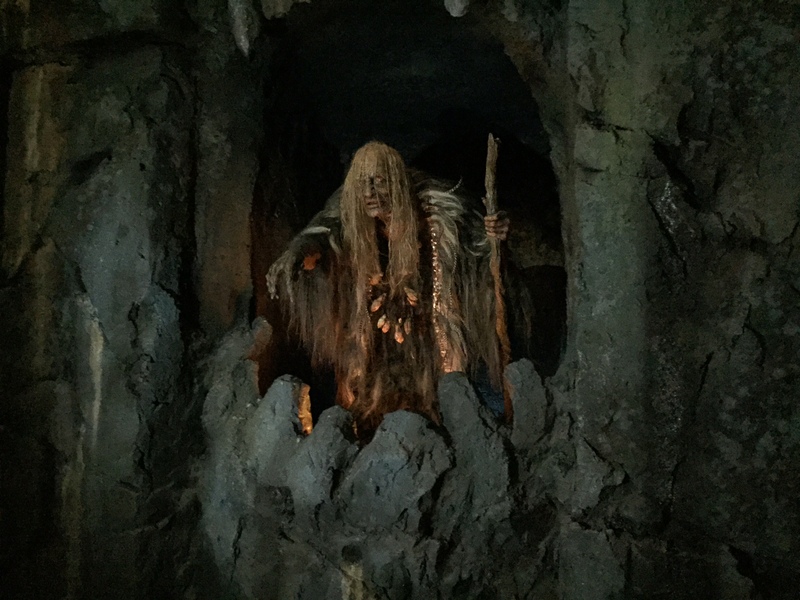 The sheer spectacle of the queue is enough to beckon anyone; and from the radio announcer, 1930s music, and witch/priestess’ frightening words, there is a coherent and steadily flowing narrative throughout the attraction queue. Even if you have never heard of King Kong (I know, that is doubtful), after passing thousands of skulls and listening to the witch-priestess chant in an unknown language about Kong, that plus the fire and cavernous rumblings tell you that Kong must be powerful and terrifying. Even after the witch-priestess causes fire and darkness, do you turn back? Of course, not! One of the most interesting additions to the queue concept that has never been done before, except during Halloween Horror Nights (HHN) is including entertainment team members commonly known as scare-actors. Scare-actors are entertainment cast, in themed costume, whose goal is to frighten you with a classic jump-scare. Ordinarily, this is something that is only done during HHN since everyone who has come to the event is there with the intention of being scared. Interesting to use the same concept on a daily operations attraction. But, this is a frightening attraction and setup very similarly to a horror film. So, looking at it that way, it is a logical progression in queue development to include live performers who can increase the scare factor. Additional animatronics are also integrated into the queue in order to heighten the sensations of terror among the park guests. 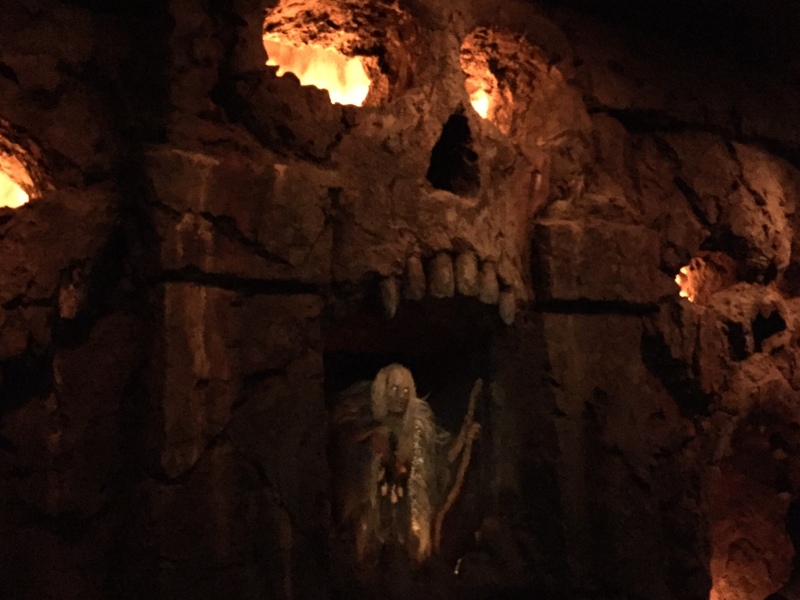 After meandering and wandering through the catacombs of Skull Island, you finally locate your ride vehicle and driver who is going to take you on an expedition beyond the stone gate. Following picking up safety glasses in order to protect your eyes from harm–oh the irony–you board the expedition vehicle. After riding in the front row on the the truck, I would advise not sitting there. So often, row one on a ride is the best no matter what is said about every seat providing an equal experience; however, on this attraction, I would advise sitting in the middle or back if at all possible. The ride vehicle at Reign of Kong is massive. It seats up to 78 park guests. So, the benefit to that is moving large crowds efficiently and quickly. Of course, there was no Express Pass queue during the soft opening, so that will definitely mitigate the efficiency and speed of loading standby (or standard queue) guests once it officially opens. At first, I thought the driver was real! The driver moved naturally and in a non-robotic fashion. Turns out that the drivers are, in fact, animatronics! Just goes to show the quality of immersion, storytelling, and theming went into Kong. The image in this paragraph is from publicity photos and shows a real driver; but the animatronic driver sits right up front behind the wheel. So Cool! Once you leave the loading dock, you proceed through the catacombs and outside to the pathway leading to the colossal stone gate. Unlike the forced perspective that is often found in the Disney and Universal parks out of logistic and engineering necessity usually, the King Kong gate is full scale. In many ways, you will feel just like Jurassic Park’s Malcolm when the doors open and you venture out into the wilds of Skull Island. During rainy weather, the attraction designers paved a way for the vehicles to bypass the gate which does take away from some of the initial impression but ultimately will not negatively affect the park guests’ experience on the ride. Having experienced the Kong attraction as part of the famous studio tour at Universal Studios Hollywood, I was very interested to see how that same technology was integrated into this stand alone attraction in Florida. 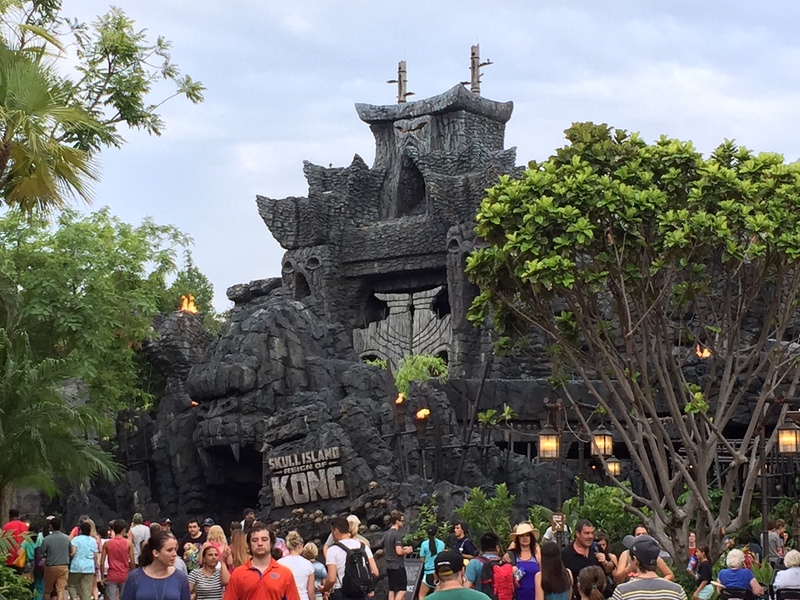 Although the rides are not identical, Skull Island: Reign of Kong at Islands of Adventure borrows heavily from the Universal Studios Hollywood counterpart. 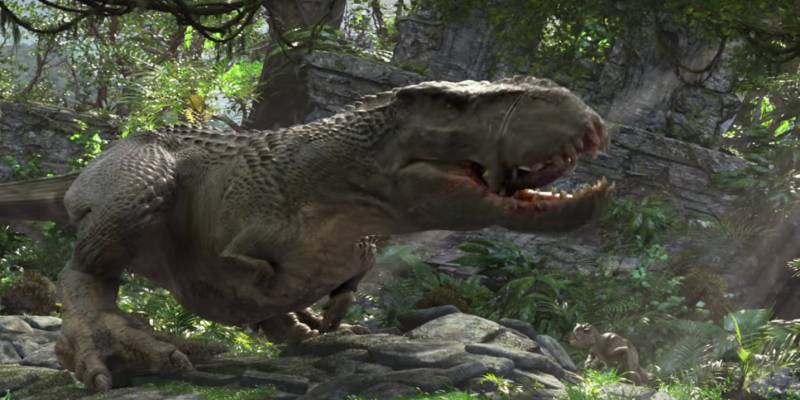 After proceeding through the stone gate, you will encounter prehistoric sized creatures over head and on the ground. You won’t be able to ignore the giant gorilla skull and bones just inside the gate. As your driver is working on his or her PhD, you will have the opportunity to meet some of his or her colleagues in the field along the expedition. As to not spoil the actual ride portion of the attraction, I will not go into too much detail but provide more of an overall analysis of the storytelling. As I have written in previous articles, a theme park attraction based on a work of literature or creative media is essentially a short film. It has, say 3-5mins (sometimes longer if it’s a show) to take the park guest through a three-act story. Paralleling the plot structure of a movie, Reign of Kong provides an exciting story for those who dare to explore the jungles of Skull Island. You have a well-defined beginning, rising action, crisis, showdown, and denouement. Although my ride experienced a technical glitch on one of the 3D screens, it did not significantly take away from the enjoyment and thrill. There are many elements I like about the attraction, but I was hoping for more practical effects and animatronics than proliferated 3D screens. Still, the visuals are fantastic and do an excellent job of immersing you into the wilds of the ancient jungle. I cannot be certain, but I believe one of the video sequences is taken from the Hollywood counterpart attraction. Best part of the experience awaits explorers just before disembarking. I won’t tell you what it is because it will ruin the surprise. But, I will tell you that it is truly a welcoming and beloved echo from the past. Theme park technology and what the modern guest is looking for may change over the years, but some things remain a constant. Being a fan of theme parks turned scholar, I greatly appreciate the closing scene on the ride. I was even a little teary-eyed when I rounded the final corner. 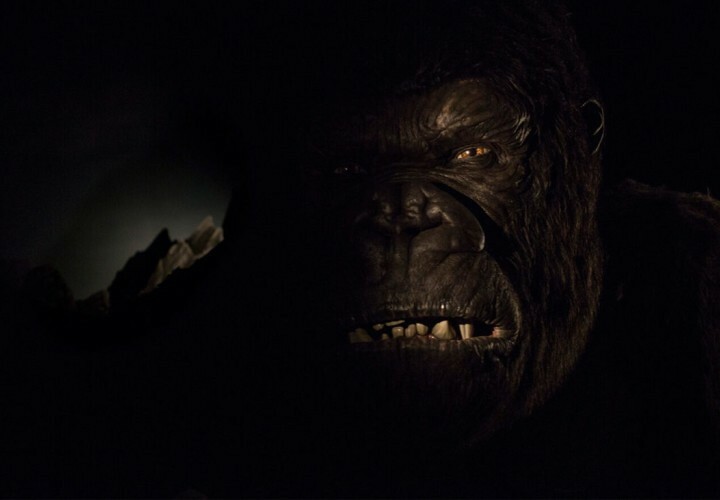 Whether analyzing Skull Island: Reign of Kong from an objective or subjective perspective, it is clear that the attraction is and will continue to be a huge success for Universal Orlando Resort. Excited to ride it again! Great article Ryan! I agree entirely! That final moment also left me teary eyed. Awesome! Can’t wait to venture into Kong’s world! Thanks for stoking the fire of my excitement!